While we in the US spent our Thursday eating turkey and watching football, the rest of the world's markets went into a downward spiral as Dubai announced it wanted its lenders to give the country a six-month moratorium on some $80-90 billion in debt. This has the potential to be the largest sovereign debt default since Argentina. Somehow this was a shocking development. (How can too much debt and real estate be a problem?) And by markets I mean gold, commodities, oil, stocks, and risk assets everywhere. They all went down. Today the US markets experienced their own sell-off, though not as deeply as the rest of the world. As I wrote last Friday, the world is now negatively correlated with the dollar, and as money went into the dollar and US treasuries, everything else went down. Vietnam devalues, Greece is looking increasingly risky, Russia wants to devalue some more, the world is still deleveraging, etc. Is this another repeat of 1998, when Russia and the Asian debt crisis tanked the markets? To get an answer, let's look at some facts about Dubai. It is one of the Arab Emirates; but unlike its neighbor Abu Dhabi, oil is only about 6% of the economy. While the foundations of the country were built with oil, the country has diversified into finance, real estate, tourism, trading, and manufacturing. It is a small country, with a little under 1.5 million residents, but with less than 20% being natural citizens - the rest are expatriates. The gross domestic product is around US $50 billion. Dubai has become a byword for thinking large. The world's tallest building, underwater hotels, the largest manmade islands (plural), indoor snow skiing in the desert... For links to more information try this from Wikipedia: "The large-scale real estate development projects have led to the construction of some of the tallest skyscrapers and largest projects in the world, such as the Emirates Towers, the Burj Dubai, the Palm Islands and the world's second tallest, and most expensive hotel, the Burj Al Arab." The list goes on and on. UBS suggests that the $80-90 billion in debt may not include rather large off-balance-sheet debt (where have we seen that one?). So, a country with a GDP of $50 billion borrows $100 billion. They build massive projects, which are now among the most expensive real estate in the world. The latest manmade island plans for one million people to buy property there. Seriously. Talk about Field of Dreams. Then came the credit crunch. Property values dropped by as much as 50%. Sales, say the developers in understatements, have slowed. Seems there was a lot of debt used to speculate on real estate, not to mention buying Barney's, Las Vegas casinos, banks, etc. And while US banks have little exposure, it seems England has about 50% or so of the debt, with the rest of Europe having the lion's share of the remainder. Admittedly, the estimates seem to confuse the debt of Dubai with that of Abu Dhabi, so it is hard to know a reliable number, other than that European banks are the most exposed. Now, here's the deal. Abu Dhabi has the world's largest sovereign wealth fund, at over $650 billion. 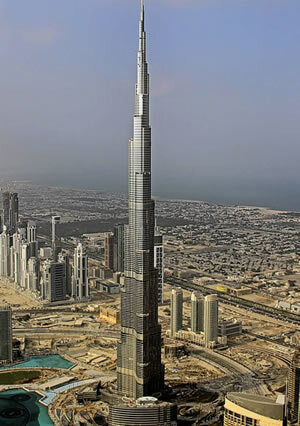 Dubai has a "mere" $15 billion. If they cared to, Abu Dhabi could write a small check and make all the problems disappear. It just seems that they are not ready to do that, at least not yet. Abu Dhabi already got the world's tallest building on past debt problems. Construction and real estate were as much as 25% of the economy. Let's see. Large leverage with maybe $5 billion in interest in a $50 billion economy that is 25% construction? A construction and real estate-driven economy. A real estate bubble. Sound like California, Florida, Spain? How can this be a surprise, except that everyone expected big brother Abu Dhabi to pick up the check? While Abu Dhabi did advance $5 billion earlier, Dubai is not letting that money out of the country. There are projects to be finished, you understand. From where I sit, this is just rather hard-headed negotiations, a restructuring of who owns what and who will get what assets. It will all settle out. Given the massive losses that world banks have already taken, this is rather small potatoes. So why the reaction by the markets? Because I think many participants know that the potential for there to be a serious correction is quite real. When anything as relatively small as Dubai spooks the market, it should serve as a warning sign. The world has priced in 5% GDP growth for the US and much of the developed world in the equity and commodity markets. Either we have to get that or the markets are going to have to come back to the reality of what I think is going to be a much lower growth figure. But in any event, one of the lessons to be learned is that investors should pay attention to where the leverage is. Unsustainable debt trends end in tears. They always do. Spain, Greece, Italy, the UK, and Japan will all have to face major restructuring in the next decade due to leverage. And we in the US will also find that we cannot grow debt at our current levels. Will we pare our debt willingly or be forced to by the market? Either way, it will make for a less than optimal economy over the coming years. Muddle Through, indeed. The headlines said that initial claims dropped to 466,000 here in the US, finally falling below 500,000. This was greeted with proclamations of recovery. First, let me say that 466,000 people filing for unemployment is still way too high. That is a lot of people losing their jobs, and when we first crossed over 450,000 a few years ago that level was seen as a sign of recession. Second, the headline number was a seasonally adjusted number. The actual number was 543,926. What is happening is that we are coming off of wickedly high numbers in 2008 and a seasonal number that was much lower in the preceding years. It is another part of the Statistical Recovery. And this trend is likely to keep on for the rest of the quarter. My friend John Vogel, who analyzes the unemployment numbers for me each week, shows pretty convincingly that the average for this current quarter will be over 500,000 per week on a non-seasonally adjusted basis. This is less than a 10% drop from last year for the same quarter. Job losses are continuing to mount, and we are on our way to an 11%-plus unemployment number by next summer. Statistical Recovery, indeed. I am optimistic by nature. An entrepreneur friend of mine gave me a term that I have grown to love. She calls it "psychic income." It's that bit of hoped-for future income that is in our minds, that drives some of us, inflicted with the entrepreneurial gene, to do the next deal, make the next big plan, scheme yet another scheme to finally hit whatever counts as the big one for each of us. How much better would our life be, how our problems would go away, if only this one thing would come about! It has not yet become real income, yet we live and act as if it is almost real. We can feel it getting ready to happen. It is still in our heads, this psychic income. Yet it is in some ways real for us. I graduated from seminary in the winter of 1974, entering the workforce in the hard year of 1975. We were coming off a recession, about which I technically knew little. I did know jobs were tight. I was unknowingly faceing another eight years of high unemployment, a tumultuous stock market, rising commodity prices, high inflation, and rising interest rates. Japan was just beginning to be a real force in the world. People were still buying bomb shelters, as Russia was a feared and powerful enemy. As the price of gold rose, there were those who told us the dollar would soon be worthless (the Fed was a problem and the deficit was out of control), and so we needed to buy yet more gold and also a year's worth of dried food. But I got lucky, and through a series of events got into the investment publishing field in the early '80s, then partnered in an investment firm, and then went on my own in 1999. I stuck this letter on the internet in August of 2000, and things just took off. But it's not just me, it' is tens of millions of entrepreneurs and businessmen and women in the US, and hundreds of millions worldwide, that have the same ambitions and drive. Every night we go to sleep on our psychic income, and every day we get up and try to figure out how to turn it into real income. And some of us are talented or lucky (that would be me) enough to make it happen. But the point is, that is just what we do - we live through it. In spite of the problems, we get up every day and figure out how to make it. Would it be better if we could get our act together in (pick a country) and not be forced to adjust because we have come to the end of the line? Yes, I know we will likely have some very tumultuous times ahead of us, making business and investment decisions more than a little difficult. Let's look at some changes we are likely to see over the next few decades. My view is that we have a number of waves of change getting ready to erupt on the world stage. The combination of them is what I call the Millennium Wave, the most significant period of change in human history. And one for which most of us are not yet ready. Alzheimer's disease requires somewhere between 5-7% of total US health-care costs. Defeat that and a large part of our health-care budget is fixed. And it will be first stopped and then cured. Same thing with cancers and all sorts of inflammatory diseases. There is reason to think a company may have found a generic cure for the common flu virus. Energy problems? Are we running out of oil? My bet is that in less than 20 years we won't care. We will be driving electric cars that are far superior to what we have today in every way, from power sources that are not oil-based. What about nanotech? Robotics? Artificial intelligence? Virtual reality? There are whole new industries that are waiting to be born. In 1980 there were few who saw the rise of personal computers, and even fewer who envisioned the internet. Mapping the human genome? Which we can now do for an individual for a few thousand dollars? There are hundreds of new businesses that couldn't even exist just 20 years ago. Twenty years ago China was seen as a huge military threat. Now we are worried about them not buying our bonds and becoming an economic power. Niall Ferguson writes about "Chimerica" as two countries joined together in an increasingly tight bond. In 20 years, will Iran be our new best friend? I think it might be, and in much less time than that, as an increasingly young and frustrated population demands change, just as they did 30 years ago. Will it be a smooth transition? Highly unlikely. But it will happen, I think. I look at my kids and their friends. Are they struggling? Sure. They can't get enough hours, enough salaries, the jobs they want. They now have kids and mortgages. And dreams. Lots of dreams. That is cause for great optimism. It is when the dreams die that it is time to turn pessimistic. But am I going to just stop and say, "What's the use? The Fed is going to make a mess of things. The government is going to run us into debts to big too deal with? We are all getting older, and the stock market is going to crash?" But thankfully, I am not limited to only investing in the broad stock market. I have choices. I can be patient and wait for valuations to come my way. I can look for new opportunities. I can plan to make the tax burden as efficient as possible, and try and insulate myself from the volatility that is almost surely in our future - and maybe even figure out a way to prosper from it. This week I go to New York to be with Todd Harrison and so many friends at the annual Festivus, put on by the folks from Minyanville. Then the theater on Saturday with Barry and Toni Habib to see Gods of Carnage. Then back home for the rest of the month, turning to book writing and waiting for my granddaughter to appear. And speaking of psychic income, I remarked to some of the kids the other day that for the first time in my life I have no psychic income. There is no scheme I am working on that will change the world, no dramatic visions of grandeur. Just working on improving what we do in the best ways we can, which should be enough; but for me it is a different feeling. I worried that I was losing my edge, my drive. "Dad," said Tiffani, hopefully prophetically, "that just means the best and most exciting thing of all is actually going to happen. Finally." I love the future. It is going top be the best thing ever. Have a great week. This is the first I've ever heard of the term "psychic income" - and it accurately describes what keeps me going. I decided to start 5 businesses last year and now I have 3 that are doing well, a that is poised to take off, and 1 that's failing. We all need to do more and hedge our bets if we are to survive this recession. I decided to create an "awesome depression" and 2010 will be my year. 29 Nov 09, 19:42 Mauldin now in denial - and going down. Poor John, it's as if he has reached a point now, where he really cannot go any further. The effects of the corrupt world have finally taken their toll on this former crusader and what remains is the defeated, burning shell in denial. Like any captive would, he has retreated inwardly to the last bastion of the home. Family and a false sense of tranqillity have beguiled a true awareness into 'psychic putty'. Rather than feasting on turkey, get the whole clan galvanized into action. Activate a sense of urgency. Remain on your feet man! , or live out your life on your knees. This website is amazing !